The Pink City, India’s first planned city, capital of Rajasthan. Jaipur is many things, all at once. The city was founded in 1727 by Maharaja Sawai Jai Singh II, the ruler of Amber. He shifted the capital to the newly laid city of Jaipur due to the increase in population and scarcity of water. Under the able guidance of Vidyadar Bhattacharya who based the architecture on the principles of Vastu Shastra and Shilpa Shastra, Jaipur was born. Even in those times, the city was architecturally very advanced. After the King’s death in 1773, severe in-fighting broke out and Jaipur lost large chunks of territory. In 1818, Maharaja Jagat Singh of Jaipur signed a peace treaty with the British. Eventually, it joined the Indian Union in 1947. At present, Jaipur’s current population is about 3.2 million and it is a major centre for both traditional and modern industries. It is the largest exporter of Gold, Diamond and Stone Jewellery in Asia. Jaipur’s economy is dependent on Tourism followed by gems, jewellery, IT, ITES, crude oil, pharma, telecom, banking, ball bearings, edible oil, electronic items, general engineering and manufacturing and ready-made garments. Jaipur is also known for its fine range of ceramics, pottery, durries, dyeing and printing, hand-made paper, handicraft items, brass and lacquer work, enamel work, woolen and silk carpets. As for the culture, Jaipur’s rich heritage is reflected in its cuisine, attire and festivals. The streets bustle with men and women wearing colourful turbans and ghagra-choli. Their main language is Rajasthani though Hindi and English are widely spoken. The cuisine is vegetarian and uses a lot of ghee and butter and delicacies like Dal-Bati Churma, Mawa Kachori, Besan Ka Gatta, Ker Sangri, just have to be savoured! ‘Ghoomar’ is the main folk dance of Jaipur, performed by women in voluminous skirts. The best time to visit Jaipur is in winter. It has a hot semi-arid climate, and temperatures remain high throughout the year. From April to July, temperatures go beyond 30 °C. During the monsoon, the city gets some respite. The winter months (November to February) are mild and pleasant. City Palace - This palace complex is one of the most popular tourist attractions in Jaipur. The palace was built between 1729 and 1732, initially by Sawai Jai Singh II. It has two magnificent palaces, courtyards, gardens and buildings. 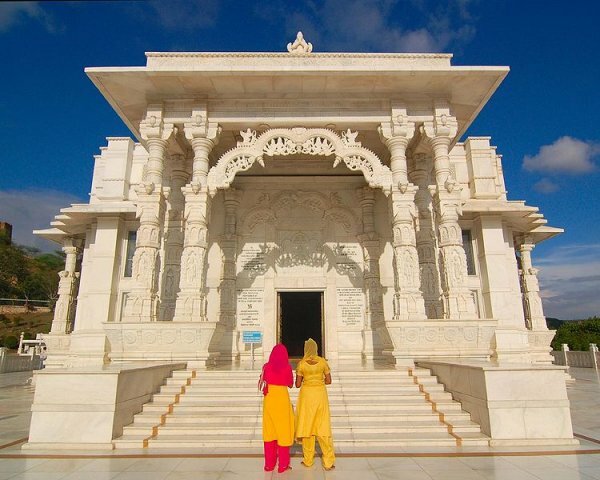 The architecture is a fusion of the Rajput, Mughal and European styles of architecture. It also houses a big museum which has an impressive array of artifacts. Stepping into the palace transports you to the glorious past. 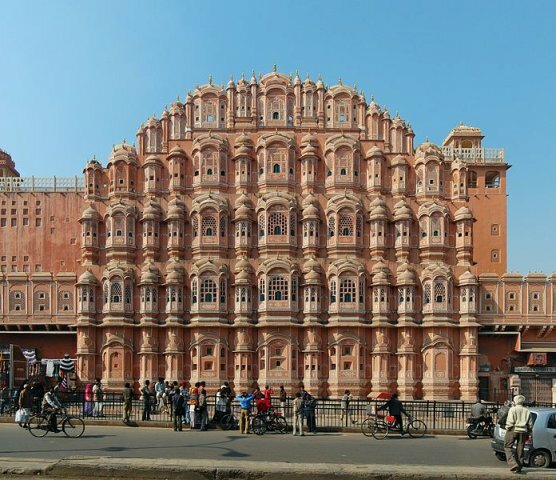 Hawa Mahal – This ‘Palace of Winds’ was built in 1799 by Maharaja Sawai Pratap Singh. It was designed by Lal Chand Usta in the form of the crown of Lord Krishna. Its unique five-storey exterior has 953 small windows called jharokhas that are decorated with intricate lattice work. A true architectural marvel! Amber Fort - Located 11 kms from Jaipur, this was the capital before Maharaja Jai Singh shifted it to Jaipur. 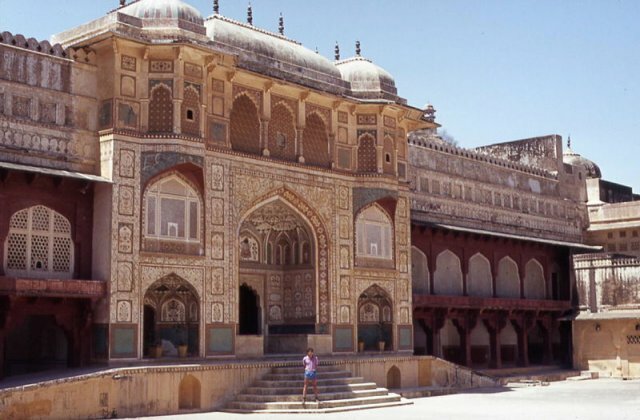 Amber Fort is known for its unique artistic style, blending both Hindu and Mughal elements. There is a lovely lake calle Maota right next to the fort that adds to its charm. Chokhi Dhani Village - Situated at the outskirts of Jaipur, this is a representation of the culture, traditions and lifestyle of village life in Rajasthan. It comprises of a 5 star ethnic village theme resort with 100 cottages, multicuisine restaurants, banquet halls, spa, barbeque and a Sheesha (Hukkah) lounge and many more themes. Developed in 1989, this 22 acre village is one of the most popular tourist attractions in Jaipur.